Sometime in February, 1708 an almanac went on sale in London titled Predictions for the Year 1708 by Isaac Bickerstaff. This almanac lay the groundwork for an elaborate April Fool's Day prank that was perpetrated upon one of England's leading astrologers. Almanacs were the most popular form of literature at that time, and they usually contained astrological predictions about the coming year. One of the events predicted by Mr. Bickerstaff was the death "by a raging fever" of the famous astrologer John Partridge. Bickerstaff predicted that Partridge would die at exactly 11 p.m. on March 29 of that year. Londoners were shocked and amused by this bold claim. But almost immediately Partridge issued a reply, claiming that Bickerstaff was nothing but a fraud. "His whole Design was nothing but Deceit,/ The End of March will plainly show the Cheat," Partridge declared. Now the gauntlet had been thrown down. All of London held its breath waiting to see who would be proven right, Partridge or Bickerstaff. In other words, would Partridge die on March 29, or survive? On the night of March 29 Bickerstaff issued an elegantly printed, black-framed Elegy announcing that Partridge had died. Bickerstaff said that he had gone to see Partridge as he lay dying in his bed, and that with his last words the ailing astrologer had admitted to being a fraud. Partridge had only written his predictions, Bickerstaff explained, in order to earn enough money to support his wife. On March 30th or 31st an anonymously penned pamphlet was also circulated around London titled The Accomplishment of the First of Mr. Bickerstaff's Predictions. It declared that Bickerstaff's prediction had come true, but noted that its timing had been off by four hours, since Partridge had died at 7:05 p.m., not 11 p.m. Given the slow speed at which news travelled, the word of Partridge's death only became generally known throughout London on April 1st, April Fool's Day. But Partridge was actually still alive. On April 1 he was woken by the sexton outside his window who wanted to know if there were any orders for his funeral sermon. Then, as he walked down the street, people he knew stared after him or stopped him to inform him that he looked exactly like a deceased acquaintance. Enraged, Partridge published a pamphlet in which he insisted that he was still alive and that Bickerstaff was a fraud. Bickerstaff coolly responded by arguing that Partridge was obviously dead, since no living man could have written the rubbish that had appeared in his last almanac. Bickerstaff also noted that Partridge's own wife had admitted that her husband had "neither life nor soul." It turned out that Isaac Bickerstaff was actually a pseudonym for Jonathan Swift, author of Gulliver's Travels. Swift's intention had been to embarrass and discredit Partridge, apparently because he was annoyed by the astrologer's attacks upon the church. Swift declared that Partridge would die "by a raging fever" since Partridge himself had predicted that a fever epidemic would sweep through London in early April, 1708. 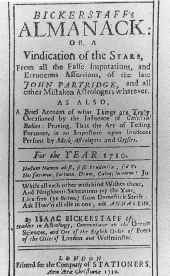 Swift's hoax succeeded in discrediting Partridge as an astrologer and eventually forced him to stop publishing his almanac. Mayhew, George P. "Swift's Bickerstaff Hoax as an April Fool Joke." Modern Philology, 61 (May 1964): 270-80. Fedler, Fred. Media Hoaxes. 1989. p.3-5.